Do you want to prepare Murunga Ila Parippu Kootan Recipe in your home? 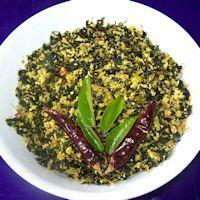 Murunga Ila Parippu Kootan Recipe is tasty and healthy food which is available in Kerala. Read here about Ingredients and preparation methods of Murunga Ila Parippu Kootan Recipe. The Murunga Ila Parippu Kootan is really good for health and it contains many nutritious and proteins in it, Adding to that Drumstick Leaves (Murunga Ila) is highly nutrious and filled with potassium, iron and proteins. This parippu takes a preparation time of about 45 Minutes. For cooking it takes just about 15 Minutes. We can serve it for 6-7 at instant.Parripu is highly delicious and it is one of the must like recipe among Keralians. How to Prepare Murunga Ila Parippu Kootan Recipe? STEP 1: First of all the take the required vessel for our covinience,then wash and pressure the toor dhal for 2 Whistles, After 2 whistles open up the Pressure cooker with care and mash the toor dhall and keep it aside. Clean the drumstick leave and discard the yellow leaves which won't be gud.wash the Green Drumstick leaves for 2-3 times till the impurities washes out. Grind the pearl onions and Half teaspoon chili powder to a paste, if the paste haven't grinded completely don't worry for it. Take a Kadai cleaned Pour the cooked Dhal as the Dhal starts boiling add the onion in it, Cook it for 10 minute in Medium flame. Cook it till the chili powder gets of its raw smell. Next we have to add the turmeric powder and chili powder in kadai and stir it for another 5 minutes, Cook with the required amount of water to get the consistency of curry till that cook it with medium flame if the flame is high it may get to bad consistency. Then Make a paste of coconut and cumin at good paste, this will be most common in Kerala vegetarian cuisine Now add some drumstick leave to it and add some required amount of salt to it. Make the Whole thing to cook in a Medium flame for about 10 min for consistency. Pour the coconut paste and cook it again with it, that's it it got over and finally turns off the flame. In the Small tempering pan heat the coconut oil, till it becomes brown. Hats it the full cooking preparation end and got it with a delicious Murunga Ila Parippu Kootan. The Parippu Kootan is good in Iron, Potassium and contains good nutrients. This is considered to be a one of the Kerala's heritage food. Especially this Parippu kootan is delicious with Piping Hot Rice, Pappads, Fresh Mango Pickle etc. and it is a non-avoidable food items for Kerala people. This is good for each and every one. Please try it in your lifetime ones and it looks delicate and tasty with the smell and contents. Try the Murunga Ila Parippu and share your comments for us.